The David Jones store on the south side of Bourke Street was built in two stages in 1929-30 and 1938 as the flagship store of G J Coles Pty Ltd to a design by the prominent Melbourne architect Harry Norris. George Coles opened his first variety store in Smith Street in 1914 with the slogan 'Nothing over 2/6', opened a store in Bourke Street in 1924, and by World War II, despite the Depression, the company operated eighty-six stores throughout Australia, many of them designed by Norris. Norris was the architect for G J Coles & Co, and was a frequent visitor to the United States, where he studied the latest trends in American architecture and in retail design, and his work in Melbourne showed a strong American influence. His buildings demonstrate the move towards greater use of colour in facades in the 1920s and 1930s, especially in the use of glazed terracotta. The seven-storey eastern section of the store was built by E A Watts, costing ₤500,000 for the site, building and fitout, and opened in March 1930. The 1938 four-storey extension by Cockram & Sons matched the original in style but destroyed the symmetry of the first building. The store was famous for its first floor cafeteria, decorated in a Mexican-inspired Art Deco style, the first and largest in Australia and a highlight of shopping trips to the city for many Victorians. The store was sold to David Jones in 1986 and was altered by the architectural firm Bates Smart & McCutcheon; the exterior was left intact but the cafeteria and many of the Art Deco interior features were removed. David Jones is Australia's oldest department store company, having opened their first store in Sydney in 1838. The David Jones store is a seven-storey reinforced concrete and steel building with a four storey extension to the west, both in a Commercial Gothic style. 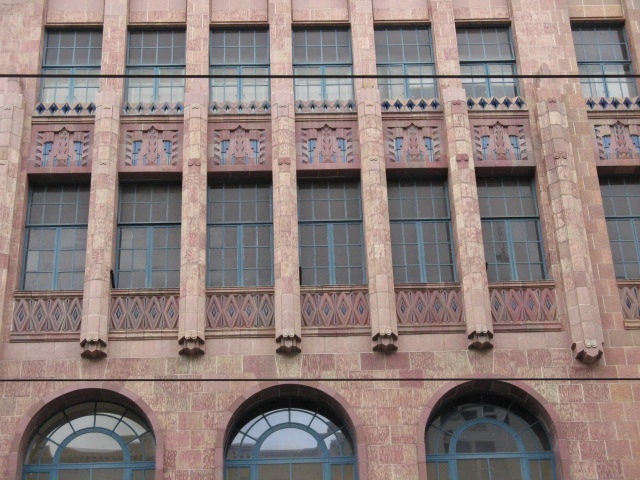 The facades are clad with striking pinkish-red Wunderlich terracotta faience, with decorative Hispanic/Indian/Jazz details in pink and blue. The first floor windows are arched with wrought iron railings and above these narrow terracotta clad ribs rise up between the upper windows through the decorative parapet above. The metal window frames are painted blue. The Little Collins Street facade is in a similar mode but is less ornate, and its upper levels are clad in cream rather than pink tiles. The original shopfronts have been replaced. Vestiges of the original interior decorative scheme survive in the tiling on some of the first floor columns and in some plaster ceilings on the ground floor. The David Jones Store is of architectural, historical and social significance to the State of Victoria. The David Jones store is architecturally significant for its distinctive and intact terracotta facade, making it one of the most exuberant and colourful interwar buildings in the city and an early and flamboyant example of the call in the 1920s for more colour in city buildings. It was the first major Chicago-inspired Commercial Gothic building in Victoria, a style that was later adopted for the Manchester Unity and Century Buildings in Swanston Street, and which exemplifies the American influence on architecture in Melbourne at the time. It is significant as a notable example of the work of the prominent Melbourne architect Harry Norris, a major architect of Moderne style buildings in Melbourne in the 1920s and 1930s. The David Jones store is historically significant as one of the most important of the retail stores built in Melbourne in the early twentieth century. It is significant for its association with G J Coles & Co, which became a household name in retailing in Australia. The store was the flagship store of the once ubiquitous chain of Coles variety stores for over fifty years, from 1929 to 1987 and its cafeteria was a favourite meeting place for generations of Melbourne people. The site also has an association with the Coles Book Arcade, which was a Melbourne institution for the previous fifty years. The David Jones store is socially significant as a favourite shopping destination for generations of Victorians. 1. All of the building marked B1 on Diagram 2154 held by the Executive Director. 2. All of the land marked L1 on Diagram 2154 held by the Executive Director, being all of the land described in Certificates of Title Volume 10275 Folios 384, 385 and 386. Melbourne's city centre developed strongly in the 1920s and 1930s, and there was an awareness of the need to cultivate an attractive urban environment. There was a continuing interest in classicism for commercial architecture, but also influence from new architectural ideas, such as the Moderne and Art Deco and a call for more colour in city buildings. The founder of Coles stores, George Coles, purchased his father's business at twenty five years of age, and travelled to the United States to study best practices in retailing. He was fascinated by the American '5 and 10 cent stores' and, in 1914, taking his brothers Jim and Arthur into the business, opened a variety store in Smith Street, Collingwood. In 1921 he established G J Coles & Co Pty Ltd, this time with brothers Edgar, Kenneth and Norman. Coles stores had many departments ranging from cosmetics and toiletries, underwear and cheap clothing, food, stationery, hardware and even pets. With the slogan 'Nothing over 2/6' they were extremely successful, and during the 1920s they expanded and established more stores throughout Australia. 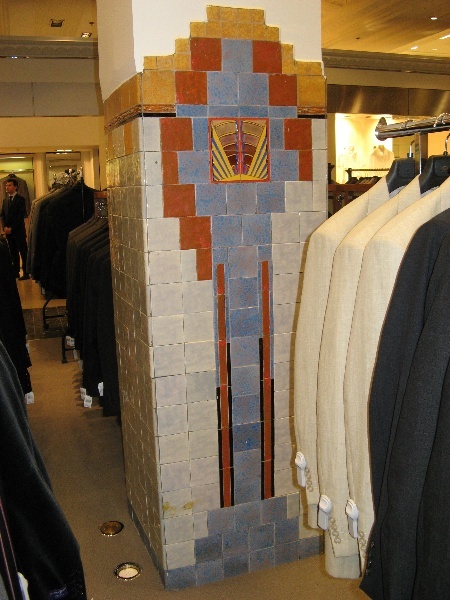 Stores were established in existing buildings or more often in new buildings, many designed for them by Harry Norris in a Streamlined Moderne style. In 1924 Coles opened a store in Bourke Street, in the heart of Melbourne's retailing precinct, opposite the Myer Emporium. 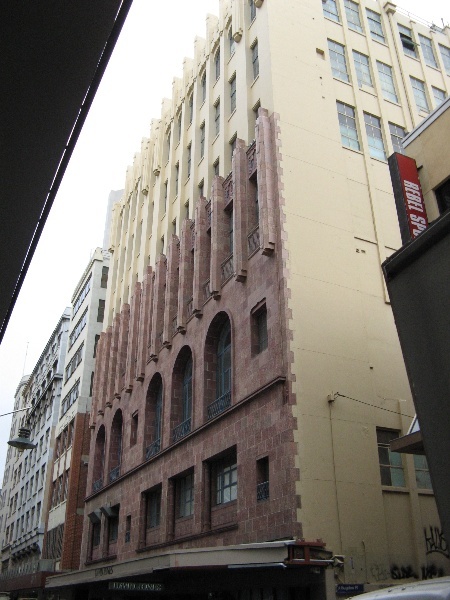 A central distributing warehouse and buying office was established at 414 Swanston Street. By 1933, despite the Depression, the chain had grown to twenty-seven branches, including three in N S W and one each in Adelaide, Brisbane and Perth. In Melbourne there was also a shipping department at 394 La Trobe Street and a warehouse at 199 A'Beckett Street. Coles sent the prominent Melbourne architect Harry Norris to the USA to study retail design before he designed the new flagship Bourke Street store. He travelled overseas annually between 1928 and 1941 and his work showed a strong awareness of trends in American architecture. Both the Coles Store and the Majorca Building, built at about the same time, are Californian-inspired. The Spanish Colonial Revival Majorca House's facade is clad in blue terracotta faience, gold foliated and spinal columns and other decorative details. The Coles store is in a vertical Moderne style with pink terracotta faience cladding. Harry Norris was the architect who responded most vigorously to the call in the 1920s for more colour in Melbourne buildings. Coles is perhaps the best example, others being Majorca House, Mitchell House and Nicholas House. 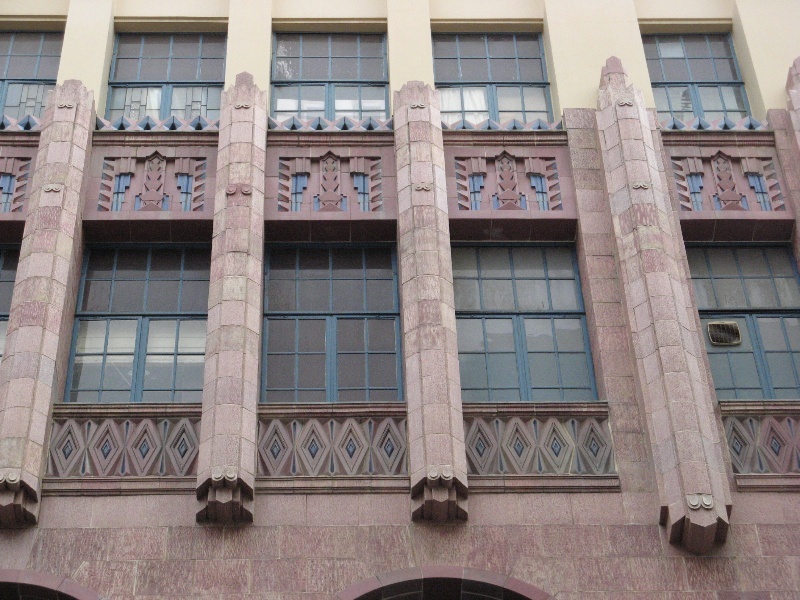 Norris was also perhaps the greatest exponent of faience in Melbourne in this period (Goad, Melbourne Architecture, p 111), using it not only for the Nicholas building but Majorca House (1928-9) and the ground-breaking jazz facades of the former G J Coles Store. Coles is still a major force in Australian retailing. In 1960 it opened its first supermarket in North Balwyn, Victoria, and by 1973, had established a supermarket in every Australian capital city. It now employs more than 92,000 staff and serving over 4.5 million customers every week. Coles is part of Coles Group Limited - Australia's largest retailing group and one of the top twenty-five retailers in the world. Harry Norris was one of the most prominent of the Australian architects to travel overseas and bring back the Deco style to Victoria. In 1929 he was sent to the USA by his client G J Coles to study retail design before he designed the Bourke Street store for them. He travelled overseas annually between 1928 and 1941 and his work always showed a strong awareness of trends in American architecture. He designed many of the Coles stores, including the ones in Smith Street and Ivanhoe. Among his major buildings were the Nicholas Building (1925-6, VHR H2119), the Majorca Building (1928-30), Burnham Beeches (1930-3, VHR H868), and Mitchell House (1937), a streamlined Moderne office block which drew inspiration from the work of the German architect Erich Mendelsohn. The new Coles Store in Bourke Street was built as G J Coles' principal store, and was one of a series of department stores and warehouses across Victoria which the prominent Melbourne architect Harry Norris designed for the retail giant. It was then one of the most distinctive buildings in Little Collins and Bourke Streets. 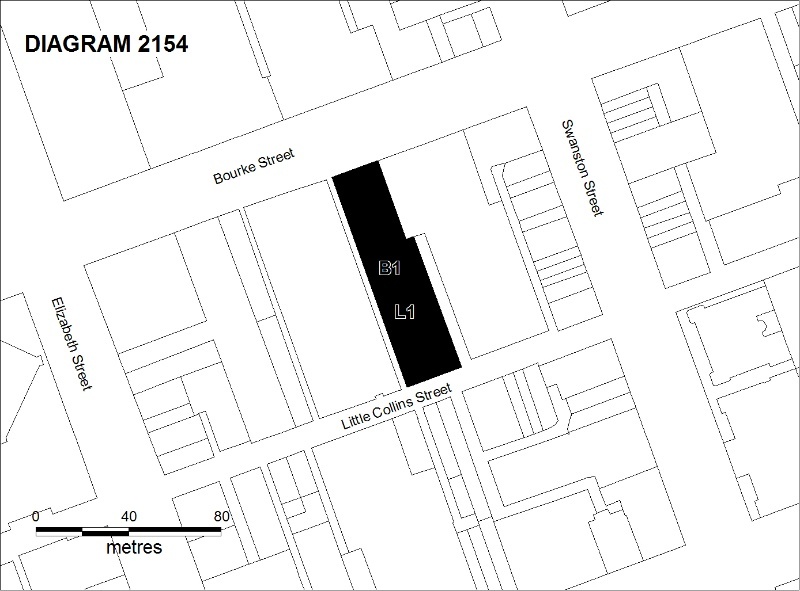 G J Coles & Co Ltd purchased the site of the well-known E W Coles Book Arcade (no relation) at 299-303 Bourke Street and the eastern, seven-storey, half of the present store was built on that site in 1928 by E A Watts. It was extended to the west in 1938 by the builders Cockram & Sons. The extensions matched the existing building in style, but were only of four storeys, and destroyed the symmetry of the first building. The article in Building (13.2.1933) as well as describing the building exterior (see below) notes the design of the interiors. It had executive offices, including a public office, a 'beautifully appointed board room, with its splendidly selected maple panelling and well designed leadlights and furniture', a large central general office and a managing director's room. Partitions were of Luxfer glass. In the store there was 'lavish use of marble, laid in Vandyke design of elongated pattern, and a wide marble staircase leading down to Little Collins Street. The lift cages were in maple, with doors of Luxfer glass. On the first floor was a cafeteria, decorated in a Mexican-inspired Art Deco style, with floors of mosaic tiles in greens, black and gold and a deeply panelled ceiling. The cafeteria was probably the largest in Australia: the cafeteria seated one thousand people and the 'quick lunch' counter added to the mezzanine floor in 1930 could seat forty-eight. Staff had their own cafeteria, as well as a hospital department staffed by a trained nurse and a gymnasium. The building was sold to David Jones (Aust) Pty Ltd and in about 1987 Bates Smart & McCutcheon were responsible for the conversion of the store, which left the facades intact but removed the cafeteria and much of the internal Moderne detailing. The David Jones building is one of the most important of the retail stores built in Melbourne in the early twentieth century. It is significant for its association with G J Coles & Co, which became a household name in retailing in Australia. The store was the flagship store of the once ubiquitous chain of Coles variety stores for over fifty years, from 1929 to 1987 and its cafeteria was a favourite meeting place for generations of Melbourne people. The site also has an association with the Coles Book Arcade, which was a Melbourne institution for the previous fifty years. The David Jones store was the first major Chicago-inspired Commercial Gothic building in Victoria, a style that was later adopted for the Manchester Unity and Century Buildings in Swanston Street, and which exemplifies the American influence on architecture in Melbourne at the time. 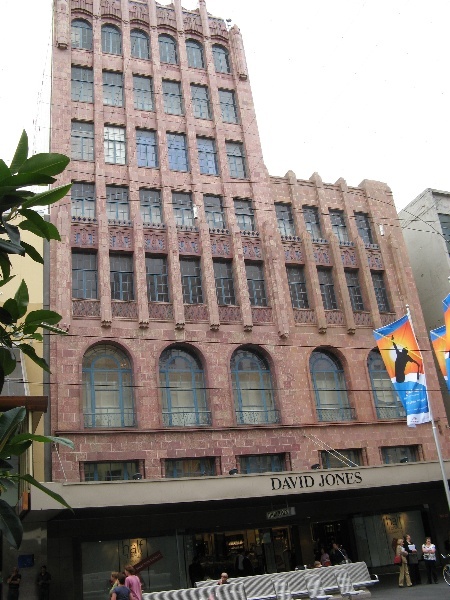 The David Jones store is important for its distinctive and intact glazed terracotta facades. This Commercial Gothic style building, with a distinctive terracotta facade, was designed by Harry Norris in 1929 as the main store of G J Coles & Co in Victoria. It became David Jones in 1987. The purpose of the Permit Policy is to assist when considering or making decisions regarding works to the place. It is recommended that any proposed works be discussed with an officer of Heritage Victoria prior to them being undertaken or applying for a permit. Discussing any proposed works will assist in answering any questions the owner may have and aid any decisions regarding works to the place. The Conservation Management Plan being prepared by Anthemion Consultancies will assist with the future management of the cultural significance of the place. The significance of the place lies in its rarity as an early twentieth century department store which has been in continuous use to the present day, and for its fine and intact facades to Bourke and Little Collins Streets. All of the building is integral to the significance of the place and any alterations that impact on its significance are subject to permit application. The existing shopfronts are not original and may be altered or replaced, with a permit. There may be remnants of the original decorative scheme surviving which are not currently visible, and where possible these should be retained. "Vestiges of the original interior decorative scheme survive in the tiling on some of the first floor columns and in some plaster ceilings on the ground floor." Actually there are no decorative ceilings on the ground floor, but the whole ceiling of the first floor survives largely intact.